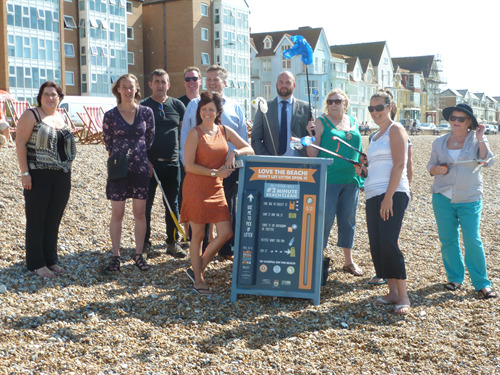 Seaford Town Council, in partnerships with Lewes District Council and the seafront businesses, is delighted to be part of the 2 Minute Beach Clean initiative, making it easier for residents and visitors to pick up litter every time they visit the beach. Originating in Bude, and brought to Seaford Town Council’s attention by Dom Smith from Frankie’s Beach Café, Seaford is currently the only south-coast town east of Bournemouth to become involved in this worthwhile cause. The Council hopes that others will now follow its example. Apart from having a dirty beach with items on it that are a risk to our health and potentially damaging to the local economy, there are lots of very good reasons to remove plastic in particular to protect the marine environment. So while a 2 Minute Beach Clean might seem insignificant in the grand scheme of things, it is really important. Every piece of plastic that is removed is no longer a danger to wildlife or pets – it won’t break down into micro plastics to be ingested by animals and possibly enter our food chain; old fishing nets or rope won’t entangle sea birds and fish killing them slowly; harmful toxins from chemicals used in the manufacturing process won’t be released into the water; and plastic bags won’t stay in the stomachs of animals or birds until they eventually kill them. Thanks go to the staff at the Martello Kiosk, Frankie’s Beach Café, and the The Galley at Newhaven and Seaford Sailing club for becoming willing custodians of the distinctive A-frame boards where you will find litter pickers and plastic bags to use. Do take your litter home with you if you can, particular during this holiday period when the bins get very full. And if you have any old carrier bags, do take them to the centres so they can replenish the boards. Spread the word by taking a picture of your ‘collection’ and popping it on Instagram (www.instagram.com/2minutebeachclean/) or Facebook www.facebook.com/2minutebeachclean).